A BUBBLING CAULDRON: A Meeting Beyond Belief! 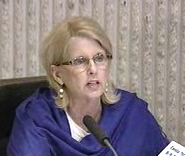 Tuesday night's brief Costa Mesa City Council meeting was one for the ages. The council chose, thankfully, to move the closed session to the rear of the meeting, so the open session proceeded very shortly after 6:30 p.m. The council had just finished two hours of ethics training with the Parks and Recreation and Planning Commissions, so they looked a little worse for wear. They must have been, because they completely forgot the Pledge of Allegiance to the Flag at the beginning of the meeting. Here is the text of my transcription of Barlow's opening statement. I've deleted the many ums, ahs and uhs for the purpose of brevity. "I was asked to conduct an investigation into the events that occurred at the DUI checkpoint. I have completed that investigation and it is my conclusion that there was no basis to conclude that Mr. Righeimer engaged in criminal misconduct, although officers at the scene did perceive that they were being directed by Mr. Righeimer to stop the DUI checkpoint. I cannot conclude that Mr. Righeimer intended to misuse his position, although he did introduce himself that way, that is common for public officials to do. He was asked to identify himself. I would be happy to offer the council some alternatives if they are not satisfied with my report. We have been asked to by a number of people to release the report. That is up to the council to determine whether to do. It is your privilege in terms of releasing it. We typically do not release investigative reports without council's approval. In addition if, certainly are many other possibilities. We could refer the matter to outside counsel for evaluation. The matter could be referred to the District Attorney's office, or even to the Attorney General's office if you believe that is necessary. And so, at this point, I am asking for your direction." Now, I'm confused. She says that Righeimer didn't engage in "criminal misconduct". OK, but is that the only standard we're using here? If he abused his authority, is that a crime? She acknowledged that the officers present "perceived" that Righeimer was directing them to shut down the DUI checkpoint. What do you call THAT behavior? What do you call it when a government official attempts to exercise authority he doesn't have? We heard the tape. We heard him threaten to call the Police Chief. We heard him tell them, "This is not gonna happen anymore." We heard him demand a meeting with one of the officers on the scene the next day. What do you call that - youthful exuberance? As they say on ESPN, "C'mon, man!" NO STATUTORY SECTION DEFINING THE STANDARD! 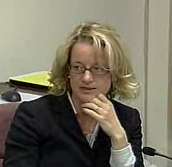 Katrina Foley, a lawyer herself, asked what is the statutory section Barlow relied on with regard to the legal standard she used to determine if there was any violation. Barlow replied that there is no statutory section which specifically calls out what the standard is for use of one's title to influence a position. It went south from there. LEECE WANTED TO "CONTINUE" IT - NOPE! There was much discussion among the council members about how much information, if anything, to release to the public. 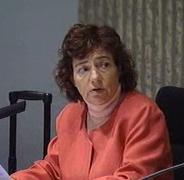 During the discussion Wendy Leece indicated that she hadn't read her emails on the subject and moved to continue the item, with Foley seconding. That vote failed, 2-3. The shortest version of events is that Allan Mansoor moved to "receive and file" the report, Gary Monahan seconded it and the motion passed, 3-2, with Leece and Foley voting no. Leece attempted to abstain from voting, citing being unprepared for this issue. She was reminded that unless she can cite a conflict of interest she must vote, so she did - she voted no. To say I'm disappointed with this outcome is an understatement. What we know now that we didn't know before is that Kim Barlow took Righeimer's version of events over those provided by multiple members of the Costa Mesa Police Department, period. No indication was given by Barlow as to the extent of her investigation - the number of people interviewed, including police officers and any civilian witnesses. No indication was provided to the public about the availability of other recordings of events. She earlier released three, two of which were useless. We are asked to take on faith that Barlow heard testimony sufficient enough to convince her that Righeimer's version of events overrode the reports by multiple officers on the scene - those officers who are trained to manage situations and citizens under stress, as Righeimer obviously was. We're asked to accept that Barlow took Righeimer's version - one that he had a couple weeks to construct - over the real-time, recorded version by multiple police officers. THERE IS ONLY ONE "TRUTH"
If Righeimer was telling the truth, then the police officers (and the tape recording of the event) were lies. Were any officers disciplined for their transgressions? No? Why not? We, the residents of this city, have a right to know whether officers who have sworn to protect and serve us are a bunch of untrustworthy liars or not. We also have the right to know whether an appointed official, running for elective office in our city, is a man who can be trusted to tell the truth. Without more information we are left to continue to speculate about the events of that evening, with the only "truth" we know being the recorded version of events - and that testimony is crystal clear. There are many potential satisfactory outcomes of this investigation. This was not one of them. Barlow could have satisfied me if she had provided legal footing for her decision and also provided some numbers - how many tapes, how many witnesses, etc. We need to know why she chose to believe Righeimer over the police officers at the scene. What was it that made his story, concocted well after the event, more viable than the tapes and testimony of the officers? R emember, many of us have heard the tape. Barlow's decision, sketchy as it was, doesn't track with what we all heard. Barlow has pronounced herself investigator, prosecutor, judge and jury in this case. Personally, without more information, I think the public has been poorly served by her "investigation" and report. Since the three members of the council who voted to simply receive and file this report - and effectively sweep it under the rug - are close political allies of Jim Righeimer, this has the stench of cover-up all over it. I'm not satisfied and I suspect many members of the public will share my view. So, I thought to my self, that was a real downer, but the next item on the agenda will be uplifting. It's a proposal by the Costa Mesa Firefighter's Association - a voluntary proposal, by the way - to help the city attempt to weather our current financial storm. The CMFA was not obligated to make any effort to help the city - they have a firm contract. However, they have chosen to work with the city staff for months to hammer out a "side letter" to the current agreement to provide some relief. That relief is $633, 400 in annual savings - at least - for the city. Maybe more, depending on how #7 below works out. You can read the staff report HERE. 1) Extension of the term of the original MOU from 2013 to 2014. 2) Agreement to suspend the salary adjustment scheduled for September 1, 2011. 3) The City will adjust salaries based upon total compensation effective September 1, 2013. 5) CFMA employees shall contribute 5% of the employee's PERSable earnings towards their employee retirement contribution beginning October 24, 2010 for 26 pay periods from that point forward. 6) If the City and other Employee Associations mutually agree to suspend the Retirement Health Savings Plan during the term of the agreement, CMFA agrees to apply the 1% employee contribution (that would otherwise have been returned to the employee) towards the employer retirement contribution. 7) The City agrees to request an RFP from the Orange County Fire Authority (OCFA) for contract fire/emergency services. CMFA agrees to initially fund the cost of the proposal. If the City subsequently contracts with OCFA for services the City agrees to reimburse CMFA half the actual proposal cost. If the City chooses not to contract with OCFA there will be no reimbursement of proposal costs to CMFA. 8) All remaining MOU provisions remain in effect. First up was our municipal clown, Eric Bever. You will recall that Bever had sworn to boycott any further negotiations with bargaining units because he wants to shove the negotiations out until after the election so his pal, Righeimer, can get some of the credit for solving the budget if he's elected. So, right off the bat Bever begins to try to demonstrate his math wizardry. Now, those of who have watched him over the years understand that he normally uses the other side of his brain - math is not his long suite. Some of us wonder, in fact, if he actually has a long suite, but that's another story. He begins to chip away, pulling numbers out of the air, trying to add apples and oranges and coming up with kumquats. He eventually gets around to telling us that, even though the firefighters have come up with a plan to save more than $600,000 dollars, it's just not enough! Nope, with his twisted math and even more twisted logic, he decided that they were not ponying up a sufficient percentage - not carrying their weight in the budget distress. He thought they were well over a million dollars short. I looked around the room at the few members of the audience in attendance. There were lots of slack jaws and heads shaking in disbelief. Bever was not without a solution, though. He suggested that we gin up a scheme to transfer money from the vehicle deferred maintenance pot to make up the difference, since, according to him, most of that goes to repairing fire fighting equipment anyhow. Unbelievable! He also made an oblique remark about how the firefighters stepped up, but the other bargaining units had not. Big mistake! Much to my delight, Bever got batted around like a shuttlecock in a badminton game by his peers on the dais. 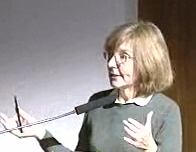 But first, former mayor Sandra Genis stood to speak during the public hearing, reminded the council that in her day on the dais this was not how they did things and suggested to Bever that, when someone who is not required to do so offers you a gift, it is customary to graciously say "Thank You", and move on. That was followed by reminders to Bever by three council members - Mayor Mansoor, Mayor Pro Tem Leece and Foley - that if he had attended the meetings he had boycotted he would KNOW what has been going on with the other bargaining units. The discussion got so heated that, at one point, when Mansoor was shouting at him to be quiet because he didn't have the floor, I thought someone might just slap Bever... one can only hope. By the way, it should be pretty easy to tabulate just how many meetings Bever has missed this year. We should run those numbers and bill him for unearned pay. BEVER AND MANSOOR VOTED "NO"! After all the discussion and fireworks on the dais the item passed, but only 3-2. Bever and Mansoor voted no. As is always the case, Mansoor could give no reason for voting against this proposal. The only thing one might suspect is that he and Bever are part of a plot to delay employee agreements until after the election, so Righeimer can be part of the process. There can be no other explanation for Mansoor's vote since he didn't give us one. Finally, they got around to the suggestion of canceling the November 2nd council meeting. There was much discussion about who could or couldn't make alternate dates for the first meeting in November because the regularly-scheduled meeting falls on election day - the Monday before or the Wednesday following were tossed out for consideration but Monahan said he couldn't be there due to prior commitments. So, in order to not cramp anyone's election parties on the 2nd, the meeting was simply canceled. The vote was 3-2, with Foley and Leece voting no. This leads us to more speculation - the employee agreements are still pending. Canceling that meeting just plays right into the Righeimer faction's hands - stretching out the process until the end of November, maybe. We'll see. All in all, I must say that last night's meeting was among the most frustrating I've seen. We saw transparency in governance take a major hit with Barlow's pathetic report and observed Bever establish a new low-watermark for city council member performance the same evening. He actually made me miss Chris Steel, for goodness sake! The b right spot of the night was the willingness of the Costa Mesa firefighters to step up to the plate and try to help with our budget dilemma. It's just too bad that some members on the council are too stupid or too stubborn to appreciate it. I called it! This city is run by obfuscating jokers! • $500 total from Colin McCarthy. $250 on 9-18-08 and $250 on 10-30-08. • Bever called for the appointment of C. McCarthy with Monahan seconding the appointment. They both voted for the appointment. • Bever voted for appointment of Mensinger. • Bever called for the appointment of J. Matthews with Monahan seconding the appointment. Again they both voted for the appointment. This is such a sad state of affairs. It is obvious Bever, Monahan, and Mansoor are doing everything they can to get this guy elected. So not only do these guys go against our cops but they are going agasint the fire department. I hope the Righeimer voters even have common sense to realize the NON investigation Barlow did on this. Both sides have no conclusion. Our city is going down hill fast. Again, do we really want our firefighters and police to be disgruntled employees. They are the glue that holds this city together! I know, let's do what Ron Reagan did to the Air Traffic Controller’s union. We didn’t' have any increase in air accidents. Would we see slower response times, blue flu, increase loss of life if we went that route? Unions are only good for those whom belong to them. They hold everyone hostage, yes even some of their membership; to collect a fat salary, make unreasonable demands on taxpayers and show they are “really” in power. Calling for strikes, slow downs, blue flu gives members the feeling that their leadership is working for them; but in truth they have to periodically do something drastic to justify their exorbitant salaries. Over the past 40 years I have been involved with 3 different Unions; none stood by me in my times of need, but if I was ever late with my dues or if I didn’t want to walk off a job, they were there in minutes. Nice that CMFA is making such a grand gesticulation, but is this just a cover to stay off the push for a 2 tier pay schedule? Is it they don’t want to see Costa Mesa hand over their koosh jobs to County control? Geoff, you know I’m not a fan of Jimmy (at all), but to say the police don’t have an agenda or that they don’t dance around the truth is a bit naive. As to the JimmyGate (Riggygate doesn’t have a flow) we have audio evidence of proof; Jimmy loses, or should have. I share your apprehension about union activities. I don't know the motives of the police union, other than to try to protect their jobs and compensation... understandable, since Righeimer makes no bones about his plans. I'd rather all this turmoil didn't exist, but it does and it looks like it's not going away any time soon. What did you all expect from the City Attorney's office? The tapes were clear - the entire incicent was less than 2 minutes, and Righeimer didn't do anything improper. He didn't throw his weight around, he expressed his opinion and ASKED who he needed to call. The tapes really did exonerate him, and what I fidn so frustrating about this is the fact that no one seems to have a problem with Rieckhof's inaccurate public comments, and his charaterization of Righeimer as a thug. It is laughable AT BEST to think that any CMPD officer, on duty and surrounded by other officers, is going to feel intimidated by Righeimer's attitude and demeanor. Sure, Righeimer should not have stopped at the checkpoint, not because of the ridiculous assertion that he was interfering with the officers but because nothing he said or did could have stopped the checkpoint, and he likely knew it. But the CMPD and CMPA took a minor incident that was, at worst, a poor choice of who to talk to by Righeimer and went to media. They blew this up for political gain. Righeimer had no duty to follow proper channels or go up the chain of command, he is a private citizen. The CMPD officers ran to the media and even told the reporter not to use their names because it was against policy. For the CMPA to turn this into the fiasco that it has become is inexcusable and wholly politically motivated. How much money did this investigation cost the city? Why no report on the alleged inappropriate comments to the media by the officers? Personally, I am sincerely disappointed in Rieckhof and the CMPA. This campaign went extremely negative solely because Righeimer raised the pay and benefit issue. Instead of debating the issues and educating the candidates and public on police compensation issues, they jumped into the gutter and went negative. Totally unnecessary. I have a great deal of respect for the men and women of the CMPD, and I do not think that the current CMPA leadership reflects the professionalism that the CMPD is well known for. Rob, as always, you and I view issues through slightly different prisms. This "investigation" is far from complete based on what we were told and - the important part of the equation - what we were NOT told. Rieckhof says there were witness statements delivered at 4:30 yesterday, so it is impossible that they were included in any analysis of the event. Rather than shed light on this issue Barlow only added one more layer of smoke to it. Let's acknowledge our individual bias' here - you're a big Righeimer fan and I'm not. However, in fairness to ALL concerned, including Righeimer, this situation cries out for clarity, not cover-up. Barlow gave us virtually NO information - no citation of the legal statute used on which she based her decision, despite repeated requests from Foley; no description of the type of investigation she conducted; no accounting of the numbers of witnesses, both law enforcement and civilian, who were interviewed and, most important to me, what information she has that caused her to believe Righeimer's version of events over trained officers with audio recordings to support them? It just doesn't square. Perhaps she was worried about losing her gig as City Attorney. Through her firm, Jones & Mayer, she does, after all, work for the City Council and a Righeimer-led council could make very short work of their contract. Rob, two out of three ain't bad. But Jimmy is not what we need in Costa Mesa at the present. Like Mansoor, Righeimer is looking to gain credibility to run for higher office. He was unable to do so in Fountain Valley so he comes to CM as a carpetbagger and schmoozed his way onto the Planning Commission. If anyone out there doesn’t see how this was all planned over the past 6 years; in reality it would have been a period of 2 years if his last attempt had have been successful, look again. If you Jimmy supporters don’t see this, PLEASE stay out of the voting booths and let the rest of us informed Costa Mesian’s who do, elect the 2 candidates who are truly running to better Costa Mesa. Too much government! Time for a revolt! Geoff, we have debated about Righeimer since he first showed up in Costa Mesa, when you started in on the carpetbagger business, which I thought was nonsense due to the fact that he purchased a home here and moved his whole family here - and has stayed for the last 4 years. I do support his candidacy, and my support is based on my personal experience with him. I have been in the market to buy a home on the Westside for several years, and have had many e-mail exchanges and phone calls with Jim regarding specific issues on the Westside and throughout Costa Mesa, including my current neighborhood on the Eastside. His level of knowledge and his attention to detail, as well as his vision for Costa Mesa, impressed the hell out of me. He does not want Costa Mesa to be Irvine, trust me, we've had that conversation. You know that I love Costa mesa because it isn't Irvine, but that doesn't mean that we don't address serious quality of life issues. I support Jim's candidacy because I truly believe that he is a far more qualified candidate than Mr. McEvoy, Ms. Lester or Mr. Petschl. I know that you love conspiracy theories, but it really is that simple. I could care less about his past runs for office, his ambition or aspirations for higher office, or his business dealings from decades ago. I'm looking for someone who, while on the Costa Mesa City Council, will deal with the budget issues, improve Costa Mesa's infrastructure, housing, and business climate, as well as focus on making Costa Mesa attractive for young families to move here. As you know, I got married a year agao, and my wife and I want to raise kids here. I have a real stake in this, and I'm not willing to vote for any candidate who isn't willing to tackle Costa Mesa's challenges head on. That includes being realistic about budget issues, run-down neighborhoods and commercial areas, degraded infrastructure, etc. I've watched him on the Planning Commission, and I have had issues with his demeanor as well, and told him so, but the bottom line is that he puts a huge amount of work and thought into every issue that comes before him. And lets be fair - he has done a good job. The LED issue is complicated, but I urge people to look at the sign that is up at SoCo Collection. It is far less bright than the LEDS at other freeway sites, and isn't obstrucive or offensive at all. I made it clear to Jim that I would not support a garish, bright, light-pollution sign, and he assured me that he felt the same way. He is getting heat for the vote, but it was unanimous and came after hours of deliberation. There are more reasons, but I am at lunch, and don't have time to lay them all out. As far as the whole police pay and benefits issue - I urge EVERYONE commenting here to go watch the forums again. All he said was that we needed sustainability. Announcing average total compensation was not going to win him any friends with police and fire, but police and fire have nothing to hide if the pay is reasonable and sustainable. If it isn't, it is imperative that the Council address the issue. As I have said before, I do not think that police and fire salaries are too high, but they should be paying the employee portion of their retirement - ALL of it. It is the employee contribution, not the citizens contribution. The city picking that up is appropriate in good economic times, but absolutely inappropriate when we're slashing vital programs and laying off employees. Great post, Geoff. I love the pictures that go with it, they make me laugh in spite of how ugly the truth is relative to some of our City Council members and their friends-all of whom are so blatantly self serving. Thanks to RiggyGate for posting the facts, OCLonghair for articulating my feelings. I have a dream that we'll have a community focused City Council with Monahan and Bever in the minority and that worthless Kim Barlow replaced. OC Longhair, my last post addressed a lot of your post, but how about this - instead of talking in generalities or alluding to conspiracy theories, why don't we start a conversation about where we want Costa Mesa to go, and who best can get us there? Personally, I think Costa Mesa is a great place, and I've made it my home for the past 16 years, but there are problems that need addressing. I've laid out why I support Righeimer, and I'd be happy to also lay out why I support Wendy Leece as well. Mr. Petschl seems like a very nice guy, but is totally unprepared to be on the City Council. Ms. Lester is bright and articulate, but she is not ready either. Mr. McEvoy is energetic and involved, but really has no platform. I sincerely appreciate his activism and involvement, but the current issues facing Costa Mesa, especially the budget, demand action, not platitudes. So, please tell me what "informed Costa Mesians" are informed about. 1) a handful of these people would not have the guts to say this to one of our police officers or firefighters if were to come to their homes or even see them on the street. 2) How all this time as a citizen, I respect CMPD/CMFD and they helped me out when I've called them, but now to see the truth come out how my fellow citizens really feel about our public servants. Keep fightin the good fight CMPD and CMFD. Hopefully this all works out for all parties involved! A great example of the kind of people Righeimer associates with. Bever, Monahan, Mansoor and the rest of Righeimer's cronies are stalling negotiations with the CMPA until Righeimer is elected. At that time, Righeimer will come in and put his name on whatever deal is made (more like whatever he forces down their throats out of spite) so he can proclaim him self the champion of pension reform and thus, claim a political victory. Give him (at the most four years) and he will be on to the next big thing: running for office in Washington. Make no mistake about it; Righeimer has no plans to stay in Costa Mesa. What plans he does have are to use Costa Mesa as a stepping stone for his personal political aspirations (just like Mansoor). Guess what Costa Mesa? We are the stone about to be stepped all over. If Righeimer is elected the only decisions he will make are ones that will benefit him politically. If carpetbaggers, grandstanders, and shady back room deal makers are the type of people you want running Costa Mesa then by all means, vote for Righeimer. There shouldn't be any anti-police comments - the Costa Mesa Police Department is a fantastic department, and the men and women who protect our city are professionals who deserve excellent pay and benefits. The CMPA somehow decided that going negative in this campaign was the right strategy, and I disagree. That is where the rancor comes from - not Righeimer. Any discussion about public safety pay and benefits should be done with the clear understanding that their salaries are not too high, and that they should have full health insurance and life, AD&D, etc. We do need to have a discussion about pensions, it is happening statewide and across the nation. Will we institute a two-tier system, with different benefits for new hires, or will we ask that the employees pick up a larger percentage of the costs? I don't know what will work best for the city and the associations. Currently, the city makes annual pension contributions for each officer that are more than many Costa Mesa residents make in a year. That's a fact, and the City needs to take a hard look at whether that is sustainable when we're looking at a $9.5 million dollar budget gap. The Costa Mesa police and fire associations are absolutely NOT responsible for the budget mess - every MOU and salary resolution was approved by the City Council. I can understand if their finances are going to be impacted because of conditions and actions that they had no control over, but that is the new reality for the private sector. If the money isn't there, it just isn't there. Geoff is right - the firefighters should be applauded for their offer, I for one greatly appreciate it. I'm sure the CMPA will make a good offer as well, it has been reported that they made one in June. I hope that the city and associatons can come to a mutually beneficial set of agreements. I sure hope that Costa Mesa citizens are ready to have many of its police officers leave and go to a city that doesn't have a guy playing with their salary/pension for his own political gain. Then, the citizens need to be prepared to have no new recruits of any worth consider Costa Mesa PD because of the above reasons. After that, be prepared to have services get even worse because there simply won't be many officers left to enforce the laws. This is what the death of a city starts with and looks like. You made some a and sincere argument for supporting Jim. You and I both know that I do not support him and let me take a few lines here to lay out why. While on the planning commission, Jim has supported and in fact championed changes that would remove the use of my Costa Mesa property. Specifically, he voted to change parking rules and RV storage rules that I simply was appalled by. 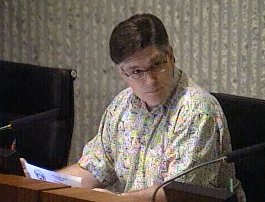 If he wanted those kinds of regs, he can live in a HOA, but don't impose them on the whole city. Now he is working on removing non-op vehicles from people’s lots. We already have rules to reduce the eyesore factor by requiring fitted covers for such vehicles. If these rules are not being enforced, then they should be. He supported the LED signs at Triangle Square, and he seems to have convinced you that they would be tasteful. I don't believe any LED signs can be made tasteful adjacent to residential property. In addition, I know and can guarantee that when that technology is deployed, it won’t be too long before the owners come back looking to add animated images. They will have spent all this money and they will be chaffing until they can use it to the fullest extent. As you overheard me discussing with Jim the other night, I thought his whole approach to the DUI checkpoint was ill conceived and petulant. That speaks volumes to me about his personality and style, which I know after all my years, will translate directly into his style of governance as we have seen on the planning commission. Add to that the political machine that he has organized in the city and I see a decade or more of the same, even if Jim moves on. This is not just an issue of who can get us from point A to point B. If that were the case then just hand the council to Millard and let him have at it. I can guarantee he will clean up the westside. You may not like it when he is done, but, what the heck? In any case, this is what elections are all about and I hope everyone in Costa Mesa is paying attention because it I feel this election will really set the tone for the community for a long time. I look forward to seeing you at the forum Thursday. Ugh!! I need a proof reader! Rob, I intended to say that you made a good and sincere argument in my opening line! Rob what if I told you that the city doesn't even fully fund crappy KAISER for its officers adn that medical comes out of the pocket of the officer? Maybe if the city were to, lets say, give the police officers the same medical benefits that the council receives the officers would be able to contribute their full portion to pers instead of having to contribute to their medical premium? The following story could be true (but I just happened to make it up). Chief of Police S - “Talk to “S”? Who the heck is “S”? Traffic Sgt. G - “We thought he was talking about you Chief, you know “S”. Chief of Police S - “Let me get this straight, he referred to me as “S”? Not Mr. “S”, Chief “S”, Chief of Police “S”, or even Citizen “S”? Mr. Dickson, about one of the few things I agree with you is the fact that the police and fire associations are not responsible for the budget mess - the city council members who signed the MOU are responsible. From talking to members of the CMPD, I have learned that the officers realize the city is in a financial crises and recognized long ago that they would have to make concessions to help. They gave the city a proposal that would save money all the way back in June. But the city council has done nothing but stall negotiations. We've heard it from Bever's own mouth when he said he would boycott negotiations until after the election. Rob, please ask yourself why the city council would do this. If you come up with a good answer please let us know. And please do not regurgitate Bever's excuse that they should wait until after the elections because some members of the current council may not be around then. Bever and the rest of the council is entrusted by the citizens with a duty to do his job until it is over. Imagine if our police and firefighters took a cue from Bever and said they weren't going to do their jobs until after the elections. It is just plain wrong and you know it. You can't deny that Bever, Monahan, Mansoor, RIgheimer and many others are working together to stall negotiations until Righeimer gets elected so RIgheimer can claim a political victory. Oh and one more thing Mr. Dickson. I know you have spent time with Righeimer personally, unlike many others on here, and that time has allowed you to form an opinion of Righeimer. Well I too have spent time with Righeimer. Just before the last election I spent an evening with Righeimer and engaged in one on one conversation with him personally over a variety of issues concerning the city and his plans. Righeimer and I share many of the same fundamental views on life and agree on many things. However, from my time spent with him I walked away with one strong feeling about him. He is a typical politician. He is no different than any other politician. He will say and do whatever has to be said or done to win approval. If you stand in his way he will knock you out of the way. And worst of all, he has ulterior motives. He is not genuine and for this reason should not be trusted to be a leader in our city. Just my opinion. Steven Dean, my understanding is that the MOUs cannot be changed without agreement from both parties. The associations can tell the City to take a hike, but that will result in layoffs. If you are right about the timing, then CMPA would be well served to head this off at the pass and make an offer similar to CMFAs (if they haven't already). One thing is for sure - pension reform is coming, it is taking hold at the state, county and city level nationwide. CHP's union already made an offer, and Los Angeles is considering 401(k)s. Those are just two examples. Bruce, thanks. Reading my posts, it is very obvious that I need a proof-reader! Regading the LEDs, have you seen the sign at SoCo Collection? It is less obtrusive than many of the existing signs at the end of the 55. Seriously - check it out. I felt the same way about LEDs as you, with visions of neon blue pasting the cloud cover and blinding everyone, but the SoCo Collection LED is nothing of the sort. One thing is for certain - we need to get Triangle Square full, generating tax revenue and thriving. Jim, another poster on the Daily Pilot blogs told me that, I read the MOU and found out that CMPD officers get a flat $670/month for health benefits (I think that is the number - it is from memory). Another poster stated that CMPA negotiated that so that it would calculate as income and increase the pensions. I do not know if that is true. Our cops do have a health benefit, in the form of a cash payout. If you know why they don't have the HMO/PPO option, let me know. ..... it is customary to graciously say "Thank You", and move on. Thank You Ms. Genis for stating the obvious. I am a member of CMPD and a resident here in the city. I will say what the CMFD did was a great show of good faith by the employees to help bridge this budget defecit. $1,050,000. It has not been mentioned, other than I saw a reference by Mr. Righeimer, wherein he said a furlough is not a pay cut. I took 104 hours off without pay, all while my wife had been laid off and was unemployed. I know what is and is not a pay cut. Our association has again made an offer to the city, it has yet to be answered in four months now. We have shown our willingness to help out. Why is it that they are not talking with us to accept our help? Thanks for bringing some clarity to this issue via your first-person experience. The furlough choice seemed to be the "least worst" of the options available. The employees kept their base rate but still lost dollars, which the City saved. Thanks to you and your brothers (and sisters) in blue for that contribution. If, as you say, there has been four months without an answer to your proposal to the city that is a troubling fact - one that is hard to explain. It is my understanding that intense negotiations are continuing - if so, and they've not responded to your proposal, what are they discussing? Very curious. I would be very surprised if Mr. Righeimer had any personal experience with furloughs - other than to impose them on others. His history, as demonstrated by the information provided by the CM police association, seems to be walking away from financial problems, letting others take the loss - then pay off those debts over a long, long time. OK, he didn't file for bankruptcy - that's a good thing. But, if he owed me a few thousand dollars for work I performed for him and didn't pay me for nine years, I still had to cover that loss of income somehow. It's a very unsavory characteristic by some members of the "power elite" - screw the little guys because they don't have the resources to effectively fight it. When I referred to the anti-police comments, I have seen several on these blogs and on DP. It's just a shame the truth from citizens has come out. If not then Righeimer has a lot of different blog names. I want to say that out of all the Righeimer supporters you should probably be the only one allowed to post because you at least make your point without cutting down the Police and Fire. The reason is I'm so pro police and fire because I have friends with CMPD as well as family and friends in law enforcement around the country. I never wanted to do the job so I commend these men and women for doing it. My question is this? Why should the PD and Fire suffer because our city mismanaged their budget. I know your going to say something to the affect of "times have changed and now we need them to help out and pay their pensions." Well, I know for a fact the PD and Fire has told the city for YEARS, yes Years, there will be a problem and they need to look at the way they spend their money. The city ignored and kept spending money. So now that times are tough the city is coming back to our civil servants and saying, "Hey, I know you told us we were overspending but we need that money back now." I say forget it! Righeimer is just using this as his political platform and going after the wrong people here. He has literally turned a city, which once loved their police, to a city now turning against them! If no one thinks that, go to the DP blogs and tell me any different. I'm glad Rob Dimel stepped up and shed some light on what's going on on the inside. The worst thing I've actually seen people say on DP is disband the police and bring in the Sheriffs Dept. Obviously, these people have never lived in South Orange County or anywhere the Deputies patrol. I have lived there before moving here to CM. Let me tell you this. They would staff our city with about 3-5 Deputies. If that! We would call them and not get the service we are accustomed too. It's obvious, some of the current council wants Righeimer bad. All I have to say is, be careful what you wish for! Go check out posts from "cmesalover" on DP. My gosh, whoever this person is thinks that CMPD is the Rampart division of LAPD. Read some of those posts and tell me the anti-police sentiment in this city isn't alive and well! NOTE: To commentors "Thomas E Fredrickson" and "NO ON RIGHEIMER": After much consideration and soul searching - and another peek at the threat letter sent to me by Righeimer's lawyer - I've decided NOT to post your comments submitted this afternoon. You know what they contained so you'll know why. Yes the police get a set amount for their medical benefits. What I am saying is that set amount of dollars per the MOU does not cover the premium for anything other than KAISER. That means the police pay out of their pocket for a PPO, dental, vision, short term disability, etc. God forbid they have a child or spouse. They pay through their teeth. Police officers, who understandably have health problems that others do not because of their line of work, have to pay for health benefits out of their pocket because the amount provided to them comes nowhere near what is actually needed to cover premiums. PS Geoff- I hope you save and frame Riggy's letter, I would. CM4LIFE, what else would you expect from Millard supporters? I would have a REAL lawyer look at it.